Can using best practices for landing page design make a real difference to conversions? You bet it can! That's how Adept helped one non-profit exceed its donation target for a key fundraising campaign in less than 24 hours. In just 10 hours the new landing page resulted in $31,000 in donations, $6,000 more than the organization's original goal. Here's Adept's step by step approach to this project so you can create higher converting landing pages. Before starting the redesign, Adept looked at what the non-profit was already doing. For this project, the non-profit's goal was to improve life for children in Magangue, Colombia by providing water resources. It needed just $24,492 to achieve this. But there were two issues. First, the donor team's usual conversion funnel focused on making phone calls to convince people to make donations, relying on the conversation for conversions. There was little focus on the web page they had set up, and people who got the link by email generally didn't donate. Second, not all aspects of the web page complied with landing page best practices. The non-profit had a lot of useful information on the page, but the amount of content was in danger of obscuring their message. This was an important area for Adept to tweak to improve conversions. Here's how Adept's Danielle Walton, who led the project, saw it: "We wanted to make sure that when people landed there they could quickly see the problem (the health crisis in Colombia), understand the impact and what the organization was looking for. They also needed an understanding of how the donation would be used and what it was going to build." The first step was to figure out who would be looking at the page. There were two key audience segments: already engaged people who were immediately inclined to donate and those who needed more detail about the situation before making a donation. Adept wanted to make sure that the landing page worked for both groups. One immediate tweak was to change the headline at the top of the page, making it bigger and bolder and incorporating a subtle call to action. 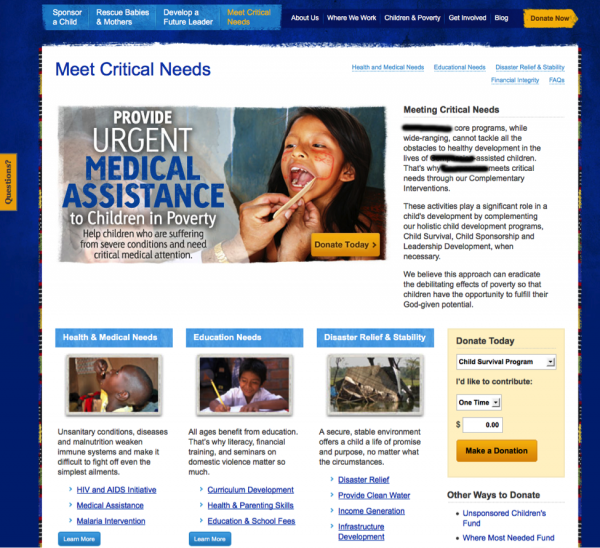 Instead of "Meet Critical Needs", Adept changed this to "Let's Prevent a Health Crisis in Colombia". This identifies the problem immediately for anyone visiting the landing page and makes readers part of the in-group helping to achieve a solution. There was a lot of content on the original landing page. In addition, there was information about the Center that Adept judged was not part of the decision path and therefore wouldn't help with conversions. The solution was to remove non-essential information and divide what was left into bite-sized chunks and most important takeaways more suitable for today's short attention spans. The top of the redesigned landing page featured a bullet point list of the key issues, suitable for those who just want a quick overview of the situation. However, the content also needed to clearly define where donations would go and how the non-profit would use them. "Some of the information was there and some wasn't," said Danielle. "The new landing page was divided into sections giving more detail on the problem, along with how the donation would solve the problem." Adept also felt the page needed more visuals to tie everything together and make it easy to get the story at a glance. "Instead of text on a page, we used design to indicate the ask and how the money solves the problem," said Danielle. adding a graphic at the top of the page of four kids, with three in blue (the non-profit's colors) and one in red (the almost universal color for danger) to visually indicate that the problem affected one in four children. reinforcing the message and the need for a solution with a photo of a child holding glasses of dirty and clean water. using hand-drawn graphics (rather than stock images) for more authenticity. Not only did these feel like they could have been done by kids, but the drawings of the water filtration systems were more appealing than photos of the real machines. The visuals also have a subtle emotional impact that ties readers into the issue even more. The redesigned landing page tells a story and creates a path to help people understand what the issue is, what the non-profit is trying to achieve, why it matters and what action the organization wants them to take. Danielle said: "We took the content and boiled it down to identify the core ask of the campaign, why somebody should care, what we were asking them to do, where the money went and what its impact would be." On the original landing page, there was a single donation box near the bottom of the sidebar. Adept moved this to the top of the sidebar, opposite the bullet points so those who got the point immediately could donate right away. Then they added another donation box at the bottom for those who needed to read all the information before making a donation. This gave readers two places to take action. Adept also tweaked the buttons on the landing page to make them "clear, large, bold, clickable and obvious." There were two main ways in which Adept created urgency on the landing page as a way to encourage people to take quick action and make a donation. The description of the issue as a "crisis" which people could "prevent" with their donations helped to highlight that. Added to that, the tracker on the goal amount let people see that they were making a difference and helped urge them to do their part so the non-profit could move quickly to a solution. The "donate today" button text reinforces that. Ten hours after launch, it was all over – the project was fully funded, raising $31,000 instead of the projected $24,492. The non-profit was thrilled with the result, as it would normally have taken them a couple of months to raise the same amount via a phone campaign. Here's Danielle's assessment of Adept's success strategy: "The small things make a difference. They had all the same info - we didn't create something new. We took what they were communicating previously, wrapped it in a different shell and slimmed it down to the things that are most important." She added: "We made sure people understood the story and felt emotionally tied to it and gave them easy ways to take action. Those elements allowed us to drive success. It's cool to realize that you can have that much of an impact and that if you implement best practices it really does work. " Understand what you need to communicate and who your audience is. Design the page to help readers work through the decision process. Make it easy to see where and how they can take action.